Does your business need more customers? How about something that is fast, targeted, inexpensive, and elicits immediate response? Then think mobile marketing, the most exciting channel available today to reach your audience. Mobile marketing is a form of advertising communicated through a cell phone or smartphone that receives SMS (short message service) messages. Each SMS can be up to 160 characters in length and most commonly is referred to as a text (TXT). Text messages are safe and spam free. Mobile media campaigns are accomplished through a software program that includes a customer database with SMS capabilities. When utilizing mobile media, a short code and keyword are integral parts of the program. The code is a 5- or 6-digit number that is used in lieu of a 10-digit phone number. This makes opting in faster and easier. The keyword is chosen by your business for your campaign and is used in your call to action. SMS are sent to willing participants only because the customer or potential customer must opt in. When your customer sends that text message, the preset mobile media software program immediately sends a bounce back notice to the recipient’s phone, such as this example. You have now successfully begun to build your opt-in mobile marketing database! So do mobile marketing campaigns really pay off? They certainly can! For example, the mobile marketing push to help the victims of the Haiti earthquake earlier this year was the most successful SMS campaign to date. Tens of millions of dollars were raised by inviting donors to text HAITI to 90999. Because the request was well advertised, people responded immediately. 4.1 billion text messages are sent and received every day. 740 billion text messages were sent in the U.S. in the first half of 2009. 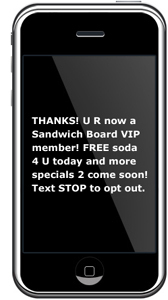 97% of all SMS marketing messages are opened; 83% in the first hour. Opt-in is key and is the primary reason mobile media is already showing much higher ROI than more traditional forms of marketing. If promoted effectively, your opt-in database will grow each day. Keep campaigns simple, and you will be amazed at your ROI and the loyalty of your brand’s following. You are currently browsing the archives for the Mobile Marketing category.